A few months back, some students from a club that I advise approached me for some advice. They wanted some ideas on a service activity that they could do just as a club. Calling upon what I've learned from the process known as ServiceSpace, I started to think small and simple, but something that also involved interacting with complete strangers. I sent a couple of the members two stories. One was a group offering lemonade in the park as a gift, the other was about a Miles of Smiles activity. Holding up signs at a busy intersection sounded a bit dangerous to them, and maybe a bit too far out of their comfort zone, but they loved the idea of offering lemonade as a gift. The students brought a few gallons of freshly made lemonade and homemade brownies. I pitched in with some more lemonade, sandwiches, and homemade ginger snaps. 14 students eagerly arrived at 1 pm with their goodies, signs, and most importantly, smiles and eagerness to serve others! It was slow to begin with, not too many people approaching us. So, the students brought the lemonade to the people. Two groups loaded up a tray with lemonade and treats and hit the pavement. They approached children, dog walkers, you name it! There was a group of men who looked to be a bit on the rough side; maybe even living without shelter. I put a tray of sandwiches and lemonade together and asked the students if anyone wanted to join me! Four of them quickly jumped at the chance and grabbed some brownies. We all went over and the men gladly accepted what we had to offer; they were so grateful to the students. We ran out of goodies and lemonade within an hour. Fortunately, they also brought a hand juicer, lemons and sugar. 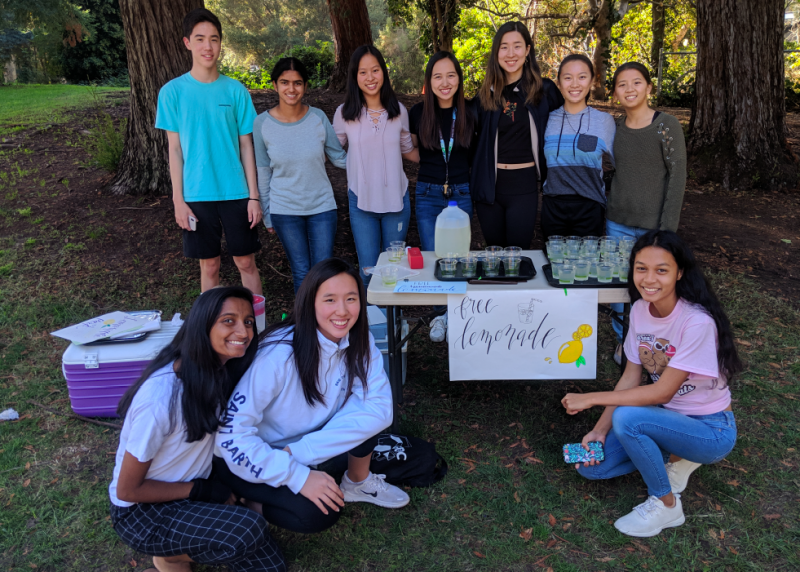 So, a few students got busy juicing the lemons by hand and making lemonade right there in the park! People would come up and ask us why we were doing this. I just looked at them and said, "ask the students." The students, in turn, offered answers like, "just to be kind" or "just to do an act of service." The students offered of themselves, from their heart. They also offered their time. This may have seemed small to them, but it was huge to me. There were 9th - 12th graders present. Seniors taking time out of their busy college app season. Juniors fresh off the SAT from the previous day! Just seeing students out of their homes and away from their books and electronic distractions was enough for me. Seeing them serve others was just icing on the cake, so to speak.